Greenpeace has launched an “alternative Coca-Cola holiday commercial”, highlighting that a truckload of plastic enters the ocean every minute and urging people to not let Coke choke the ocean. 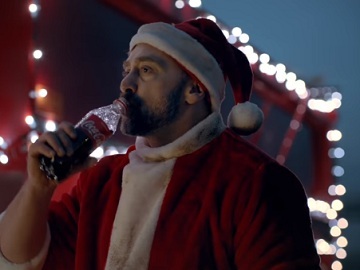 The 60-second spot, created based on the statistics that Coca-Cola produce an estimated 110 billion plastic bottles a year”, features several families getting ready for the holiday season and having pieces from Coca-Cola bottles in the most unexpected places: in the mistletoe, in the punch, at a party, in the fridge, among food, in the Christmas tree, in the chimney. Finally, the famous red Christmas truck is seen dumping a load of plastic bottles into the ocean and the driver himself, a man dressed in Santa costume, throwing over his shoulder another Coke bottle from which he drank a few seconds before. Next: UberEATS Sophie Monk Commercial: Tonight I’ll Be Eating..